If you have never seen a manzanita tree used in a formal setting, you're missing out; it's one of the most spectacular displays imaginable. 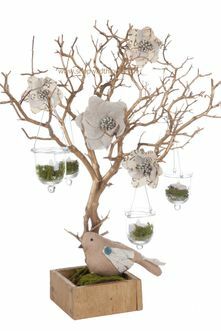 At ShopWildThings, it's our mission to provide you with all of the formal Decor you need to create the perfect environment, and that's why you'll find manzanita trees, crystal trees and beautiful LED-lit trees in our catalog. We have something for every occasion, as well as for personal home use, so you can be sure you'll find exactly what you need here. 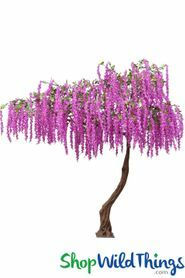 From 6.5-foot LED willow trees that make tropical-themed parties remarkable to small LED Bonsai trees that make excellent centerpieces, you will certainly find what you're looking for at ShopWildThings. We also carry many crystal beaded trees that create the illusion of a wintry wonderland or a dignified, elegant backdrop for pictures. We also offer sparkly glitter trees in our collection that are whimsical and beautiful, and they're made from the highest quality materials; we only deal with the finest products because we want your event to be perfect. Tree in Pot, 4 Feet Tall - Silver w/Light Glitter - Bendable! COMING SOON! Tree in Pot, 4 Feet Tall - Silver w/ Heavy Glitter - Bendable! CLEARANCE! Metallic Silver Beaded Centerpiece Tree "Bridgette" 30"
At ShopWildThings, it's our mission to provide you with a wide selection, as well. We have gorgeous 8-foot trees, 4-foot trees and small 2-foot manzanita trees (and everything in-between) so that you can create the right look for any space. Want to get creative? 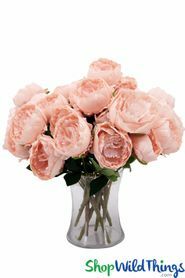 Consider making one-of-a-kind centerpieces out of available candle trees, crystal beaded trees, potted trees or one of the many other options we offer. 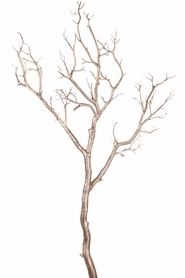 From weddings and other formal events to everyday décor that you really want to be special, you will find the manzanita trees and crystal trees you need to make it all happen in our comprehensive collection. 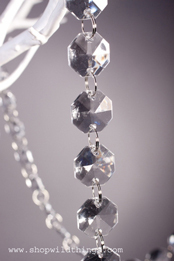 Be sure to check out our crystal garlands, LED lighting, and hanging candle holders to add even more elegance and pizazz to your tree decorations. Because we carry the finest products in the decorating world, our customers come back time and again; we want to do that for you, as well. We're glad that you found our huge selection, and we'd love to help you create the right décor for your upcoming event.